A sturdy insulator that takes the strain on metal or concrete corner fence posts. 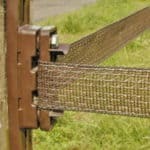 This electric fence corner insulator is also the body for the tensioners. It will take enormous strains but should only be used where a very short run is involved as it will wear tape out in time. The tape run in one direction should be no more than 20 metres. It is supplied with a pair of bolts and screws (R36U). It is used on concrete or metal stakes and there are holes in the base plate to take a pair of electrical cable ties (CT100) – not included – for the fixing. It allows tape to follow through its aperture but does not hold the tape. You will need Cable ties (CT1).